That tree on your property may have been there for years, but the time has come for it to be cut down. No one makes that decision lightly, as trees are seen as difficult to remove and often have some sentimental value. However, there will be times when you should and can cut that tree down. Here’s how to know when, and how to cut it down to keep yourself safe. Let a local tree removal company help. In many cases, you may not need to cut a tree down at all. That tree may initially be in your way, but you can find ways to get around it. For example, if you want to build a patio or deck in the same space, you could simply build around it. A tree in the decking can provide shade and beauty, without getting in the way at all. If you think the tree is declining, then it’s a good idea to talk to a tree service before you come to a decision. They can look at your tree and let you know if the issues are something you can fix, or whether you’re going to need to cut the tree down. It’s causing structural damage: The roots of a tree run further than you’d think, and if it’s quite close to your house then they can be causing damage. For example, they can block water from draining away from your house, causing damage. It’s making the property difficult to use: In some cases, the tree is just plain in the way. If this is the case, you may need to remove it in order to get the most from your property. It’s damaged: If you’ve had a big storm come through, the tree may have taken damage. This is a danger to you and your property, as the branches or the tree itself will have become weakened. If anything were to fall from the tree, it could cause damage or injury. Once you’ve decided that the tree needs to come down, you’re going to get ready to cut it. Here’s how you can cut it safely. Get the right equipment: Safety is paramount when cutting trees. You’ll need a loggers helmet, ear protection if you’re working with a chainsaw, safety glasses, and Kevlar chaps to stop a blade near your leg. Estimate the felling zone: Use the ax handle trick to estimate how far your tree will fall during cutting, and then add on an extra room if you think you’ll need it. Clearcutting and escape zones: You want to make sure you can get away safely once you’ve cut the tree, so clear the escape zones so you won’t trip and be in danger as you get away. Cut a notch: This will go in the felling side, allowing the tree to fall in the direction you want it to. If you have a larger tree, you may want to use some wedges too to fell it safely. Make the felling cut: This cut will go on the other side of the tree. Have a lookout watching over you as you do this, in order to keep you safe as you cut. Cut the branches and trunk: Once the tree is felled, you’ll need to cut the branches off in order to dispose of them properly. The trunk can be cut up into firewood if you so wish. Cutting a tree is fairly simple if you’re confident in DIY, but you may not be. If you’re not comfortable cutting the tree down yourself, call in an Orlando tree service like us here at Advance Tree Pros. 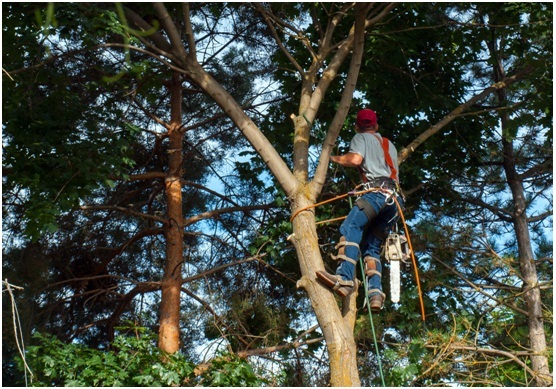 We have the right expertise and equipment to ensure that your property is kept safe as the tree is being felled. We’ll give you some of the best prices in Orlando for felling your tree, so you can save money to use on making your yard a relaxing place to enjoy on your property, without the worry of felling that tree yourself. Give us a call and we’ll handle the tree felling for you.